The country of Pakistan was formed from the northwest area of India in 1947. This also marked the beginning of its rug weaving industry. 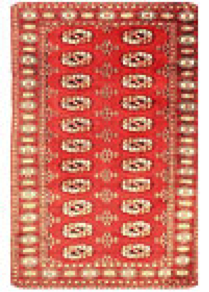 The first type of rug made in Pakistan is the Bokhara design, which uses a Mori weave process (Image 1). The design was copied from Turkoman tribal designs, which have vertical rows of guls in red, green, blue, black, rust, teal, dark ivory and taupe. These rugs have been made continuously since their inception after World War II. 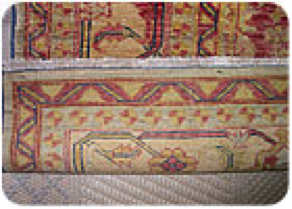 When doing your pre-cleaning inspection on Pakistan Bokhara rugs, note a structural problem that is characteristic of the Mori weave, and also with Pakistan Persian design rugs: the wefts are not continuous from one side to the other. 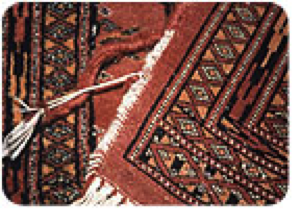 Instead of one rug being woven on the loom, there may be several rugs woven together on a single large loom. When the rugs are taken off the loom, not only are the warps cut across the ends to form the fringe, but the sides are cut to separate the rugs on the loom. This cuts the wefts so they do not wrap around the terminal warps. The sides are then overcast with matching wool. Because the wefts do not enclose the outside warps, the side finish can be easily torn off the rug by foot traffic (Image 2). This defect can create a repair opportunity but, more importantly, you do not want to be blamed for this as a result of your rug cleaning. Be careful: the Mori weave rugs have a tendency to bleed, especially the red dye. The second type of Pakistan rug is called Pakistan-Persian. The rug has the same knot and quality of wool as the Mori weave. The designs are copied from Persian rugs. This rug was developed in the 1980s when the U.S. embargo of Iran left an opportunity for other countries to supply a market that was traditionally held by Persian rugs. The newest style of rug from Pakistan is referred to as Peshawar, a city in Pakistan. These rugs do not necessarily come from that city, but are given the name to designate a particular style. They can also be called Chobi, meaning a color like wood, as most of these rugs have a light brownish color. 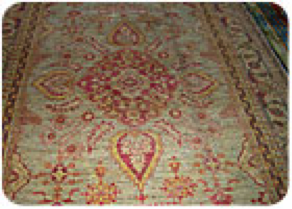 Peshawar rugs are usually chemically washed to give them an “antique” look (Image 3 and 4). They are also often tea-washed to give the warm yellow-brown look. They have a low pile, symmetrical knot and short fringe. This is a product the rug specialist should be able to identify, as it is a very popular rug and you will see several come to you for cleaning. We have discussed tea-washed rugs in the past. This process can use a natural or synthetic dye with the original process using tea. The dyes do not adhere to the cotton fringe, which results in a mottled look after cleaning (Image 5). 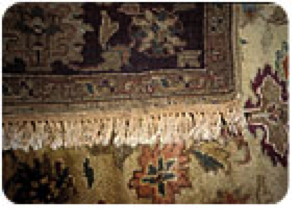 The field of the rug can also have dyes partially removed with aggressive or spot cleaning, giving a “pooling” look to the rug with light and dark areas. Also, use caution, as reds will sometimes bleed. A key item to cover in your pre-cleaning qualification of the rug with your customer is sprouts, and not the kind you find in a salad. When the yarns are spun to make this rug they are given a hard twist. The yarns are twisted so tight they curl down into the pile. When the rug is sheared, some of the tightly curled yarns hide in the pile and are missed. 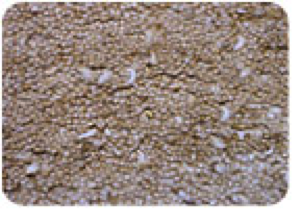 Over a period of time, these longer tufts uncurl and appear on the pile surface (Image 6). This is not a flaw; it is part of the nature of Peshawar rugs. The tufts can be clipped, but it is not necessary. However, if you do offer this type of special service, charge accordingly. 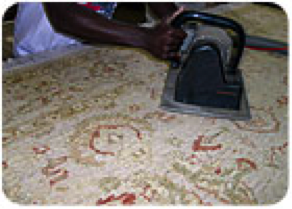 Some rug cleaners use a special shearing machine to perform this service (Image 7). Use caution when spotting these rugs. Most spotters will remove the tea-wash and leave a “light” area. Also, do not use acid rinses, as they also can remove the tea-wash treatment. Avoid hot water in the cleaning process, as this can cause red dyes to bleed. Rugs from Pakistan are not of the best quality and can have several hidden problems, but due to their reasonable selling price they are popular.